The sharp drop in oil and gas prices since last summer suddenly seems like a revenue-raising opportunity to officials in several states and even in Washington. Since consumers are saving so much money, the reasoning goes, they might barely notice if gas taxes went up, providing more money for roads and other transportation projects. At least a dozen states are considering raising gasoline taxes, including some with anti-tax Republican governors, such as Iowa, New Jersey, North Carolina, South Carolina, Tennessee and Utah. In Washington, a few Republicans and many Democrats favor raising the federal gas tax to replenish the Highway Trust Fund, which runs out of money every year and gets topped off with cash from other Treasury accounts. If there was ever a good time to raise taxes on motor fuel, now seems to be it. The last time gas prices were this low was in early 2009, at the height of the Great Recession. Washington was cutting taxes and ramping up spending instead of the other way around, to stimulate the economy. Now, by contrast, job creation is strong, workers are starting to earn more and falling gas prices are themselves a kind of stimulus program putting more money in consumers' pockets. But politicans better hurry if they want to slip a gas tax past blissed-out drivers. The euphoria over the money consumers are saving at the pump conveys the impression that gas prices have dropped to record lows. Not even close, and a modest rise in gas prices could remind drivers that gas isn't all that cheap after all. Gas prices are a weirdly important economic factor because they have an outsized impact on consumer psychology. Gas prices close to $4 a gallon bum people out and discourage other types of spending, even if the economy is strong. 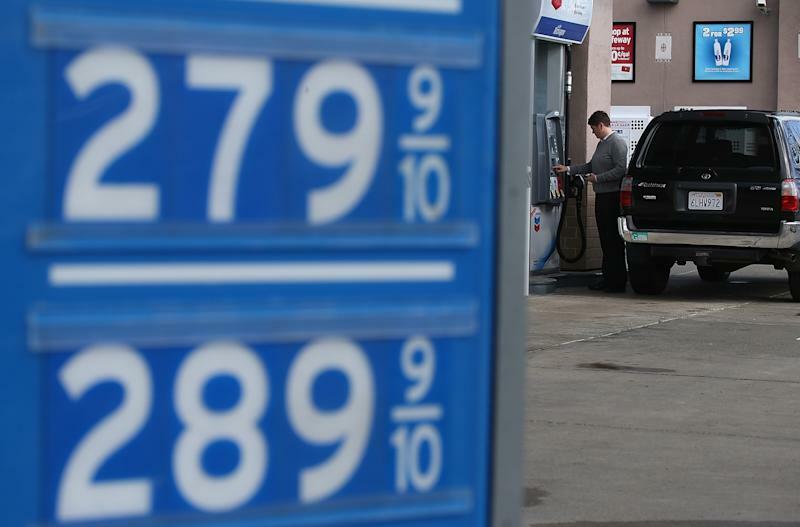 Low gas prices cheer people up, even if the economy’s weak. And sharp swings in prices can affect consumer sentiment more than the actual level of prices, which seems to be what has happened lately. The pump price has fallen by about 40% since last summer, giving consumers a bit more spending money. Consumer confidence has surged since then and is finally back to prerecession levels. The chart above also shows that for the last decade, gas-price declines have never lasted long, and the general trend has been upward. That follows the pattern in oil prices, which almost always recover from price drops in a sharp V-shaped pattern, as Yahoo Finance contributor James Dondero of Highland Capital Management points out. If that pattern holds, it would mean significantly higher oil and gas prices sometime in 2015, which could preempt the idea of higher gas taxes before they ever could take effect. At least two things are different now, compared with earlier swings in oil and gas prices. First is the emergence of hydraulic fracking, especially in the U.S., which has brought huge new supplies of oil onto the market. That contributed to the recent plunge in prices and could keep them low. Markets now seem to be seeking an equilibrium price that takes into account this new supply, along with the cutbacks that may occur since some producers lose money with oil below $60 per barrel. The other factor is the sharply improved fuel economy of today’s cars, which average about 25 MPG and are sure to go higher because of rising federal mileage requirements. In 1990, cars averaged about 17 MPG, a figure that barely rose through 2007 as modest improvements in fuel efficiency were offset by the rising popularity of big new SUVs. But MPG improvements became pronounced after that, as the new federal requirements kicked in. That means the typical driver could spend less on gas today, compared with 10 or 20 years ago, even if prices were higher. Many consumers are responding to lower gas prices with rather short-term thinking, by purchasing large vehicles with lower fuel economy than they’d probably buy if gas were at $3.50 or $4 a gallon. Those types of purchase decisions could backfire if oil and gas prices climb as some forecasters think they will. Policymakers who want to raise gas taxes may also face a limited window of opportunity. If gas prices were to rise by 50 cents per gallon, say, they’d still be well below the unpleasant highs of a few years ago. But consumers would suddenly have less money in their pockets than they did the day before. Try selling a tax hike when that happens.